It was one of those moments when energy was high. We had finished fighting another fleet. A fight that went well but not as well as hoped due to us not killing all of their ships. But it left a lot of blood pumping and twenty people running around the system. It was not a good time to be a month old player in a drake, sitting at zero on the sun while the heron alt/friend dropped probes in a highly active low sec system and seemingly oblivious to what is going around. Large numbers in system tend to mean that it is a home system or something is going on. I will give his age as the reason that he did not use dscan to see the fleet in space. And we landed on him and tore him apart. Nineteen people. Just because he was there and we were out and we kill people. We held damage and waited for the entire fleet to land before we killed him. And I looked at the killmail and saw that he was a month old and felt a bit bad. He tried to fight back once he was locked down. For some reason I am channeling that deep "oh no" feeling when a mistake has been made and nothing is going to fix it. I tried a conversation. I am debating an eve-mail. What it brings me back around to is advice. I wish that someone could have advised him not to take that drake into low sec to be killed. If I work solely on his age I can easily imagine that he does not know the area to know that Bosena is not the system one explorers in while sitting at zero on the sun. If he is used to high sec the twenty plus people in local would not appear to be abnormal to him. While I do not want people to tell people that low sec is instant death. Sometimes low sec is death and low sec is often deadly without skills. It comes down to advice and advising people and at what point are you giving advice and at what point are you telling them what to do. I argued not so many days ago with someone that helped a month old player fit a battle cruiser and go on a roam that he should have suggested something else. I was told that he didn't want to tell the person what to do and let him pick his ship and attempted to help him fit it as best as he could. My way would have been too pushy. Yet, I feel that a month old player in a battlecruiser in low sec, on a PvP roam is a bad idea. Even if it is pushy to lay that out I'd have suggested cruisers which he can fit into much better than a battlecruiser at much less cost. Because they didn't die and did in fact kill an assault frig their roam was successful. I wonder did that set up the newer player with unreasonable expectations as to day to day operations roaming for PvP in low sec? There are the popups and they need to be read when one jumps. Entering is a choice made. It is not that I feel as if he should not have been killed. He was in low sec. He was there. We caught him. It is more along the lines of his ship is expensive enough and fit in such a way that he was not prepared for low sec and it is that moment when someone needs to have someone to help them. He has been in an NPC corp since he started. That doesn't help a thing. He has lost three battlecruisers so far in low sec so perhaps he does not learn or the profits are enough for him to continue to fly them regardless. I've redone the new player tutorials recently and dscan is something that somehow needs to be introduced. After going back and forth about it I decided to write him an eve mail and see what came of it. I'm Sugar and was a member of the fleet that killed your drake in Bosena earlier today. After we had killed you I saw that you are not even a month old player. I do not know if you are new to Eve or not but I figured I could at least say something if you are. If you are not, ignore me by all means. I do not know if the Heron was your alt or your friend. It does not matter. Bosena is a very active Low Sec system with several PvP focused corps using it as their base. It also has a fair amount of traffic because it has a high sec gate to it. When our fleet found you, you were at zero on the sun. This is one of the most commonly selected warp spots in the game and a dangerous one to sit at. A safe spot would have offered you a bit more safety, but please understand we would have probed down your ship and still attacked you. When local is at over 20 people in low sec a fleet is in the area or people live in the system. People will look for you. If you are not familiar with dscan please look into it. You would have seen our fleet in space. That is never a good time to sit on the sun and drop probes to do exploration. While many may advise a drake for missions and exploration in high sec, in low sec you would do better in a cruiser or to take the time to train into an assault frigate. The agility will give you more time to escape possible traps. The finical loss is also much less. Plus, it is easier to skill fully into those ships earlier in the game then it is into a battlecruiser. People are willing to give advice on fits and help with teaching you situational awareness for places like low sec. You do not have a corp. You may be an alt, you may wish to fly solo, you may not have decided what you want to do. I can only advise you to find a corp with experienced players at this point. Eve is better with people. Exploration in low sec can be very profitable. Just be aware of those around you. Local and dscan are important tools to keeping your Drake in space. 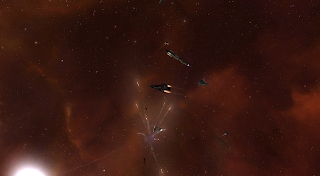 The denizens of low sec are often there for fights. Your singleton drake is an appealing target to anyone wandering by. Good job on warping out your pod. We would have podded you if we could have caught your pod. I see that you have lost other battlecruisers in low sec as well. I don't control your life or your game. I can only hope that your loses do not discourage you from this great game. After reading your post I clicked on the KM link expecting to find the sort of horrors that you often see in fits made by month-old pilots. As it turns out I was surprised by how well fit that Drake was, at least for PvE. A fully T2 tank with T2 BCS, meta 4 launchers and faction ammo in the hold? Extender rigs rather than the more effective (for PvE) purger rigs may even be a small nod to the possibility of PvP action. I really don't think you guys "kicked a puppy" this time as you put it. He looks to me like an alt or at least someone who is getting some advice from a more experienced player. The fact that it was also his third loss in low suggests that your little welcome is unlikely to scare him away from EVE. But the nice girl / ebil pirate queen dichotomy that comes through in your posts certainly makes for interesting and entertaining reading. Keep up the good (bad?) work!